The online viewer option will be removed starting in version 2.2. If you use this feature and still want to use it afterward, please install "Swiss Knife", a new extension for Opera. Do not worry, you can port your settings to the new extension using the backup/restore feature on the preference page. This extension automatically redirects you to the secure version of web pages. It also modifies the links on pages you open to make them point directly to the HTTPS version (those rules can be edited from the preference page). To add your own rule, click "Menu" > "Extensions" > "Manage extensions", then click on the gear beside "Redirect to HTTPS" and click "Preferences". KNOWN ISSUE: The insecure page is still loaded for a few milliseconds, meaning some of your information might still be exposed. Unfortunately there is no way to solve this with the current extension API. Simple calculator for calculating an average fuel consumption. the https redirects are not necessarily safe. That leaks your first wiki page or google query. the point of this extension is to be secure, and having google know everything i read is NOT secure FFS. i can't figure out how to disable it. malinkh, how you did this? отлично ! спасибо за работу ! There are security issue when searching from address bar in Google using "g search terms". 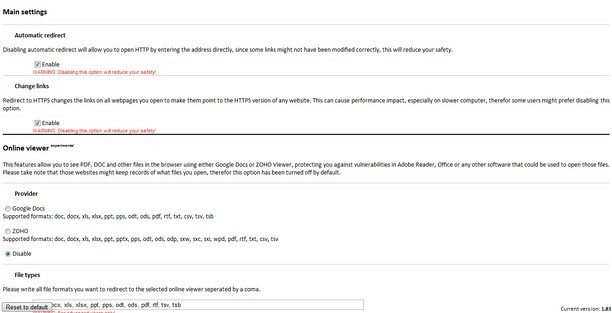 If search url in Opera configuration set to "https://encrypted.google.com/search?q=%s&sourceid=opera&num=0&ie=utf-8&oe=utf-8" then Google will respond with two redirects, first to http url and second back to https url… So your search terms will be sent by http! These redirects happens fast enough, so you may not notice https-http-https changes in address bar. To fix this change search url for "g" to something like this (you may need to change language from "ru" to something else) "https://encrypted.google.com/search?client=opera&rls=ru&q=%s&sourceid=opera&ie=utf-8&oe=utf-8"
I have an idea to make this extension better. This already supported by Chrome and Firefox. Great, but can you add an option that disables the icon? This is one of the best extensions on here. The only problems are: 1. The insecure page being loaded for a second and 2. Its not able to force the search box to use https. Maybe we could some how petition Opera to allow for functionality to resolve these issues? Unfortunatley neither this does work for wiktionary, since the redirected link will end like this: wiktionary/www/wiki which is not valid. Changing "$1" to "en" solved the problem. No problems with it so far. The redirects and rewrites work well. I guess the Google redirects are necessary for people who don't want to configure their Google settings (logged out or in). I don't know why people are whining about a toolbar icon. You're using Opera. Right click > Customize > Remove From Toolbar. It's not that hard. Any complaints from people below are from old versions, if you look at their post closely. Try it out before you decide you don't like or need it.